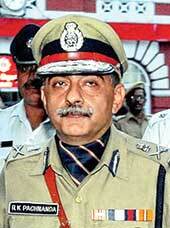 Kolkata Police Commissioner Ranjit Kumar Pachnanda has been replaced by Surajit Kar Purakayastha on 14th February 2013. Few changes made in Kolkata Police higher ranks after the saddest incident happened at Garden Reach on 12th February 2013. A Policemen shot death during the clashes between TMC & Congress party workers on the issue of College Election at Garden Reach (Kolkata) on 12th February 2013. West Bengal Chief Minister Mamata Banerjee made changes to uphold the law & order situation of Kolkata after that incident. Today (14th February 2013) in the evening, the decision was made & few alteration has been done in the Kolkata Police. Surajit Kar Purajayastha named new Commissioner of Police (CP) and R.K. Pachnanda will now work as Director of Security, in-charge of the Chief Minister's security. New Commissioner of Police (CP) – Surajit Kar Purakayastha. New Director of Security, in charge of Chief Minister’s Security – Ranjit Kumar Pachnanda. New ADG Administration – Birendra Singh. New ADG IB – GMP Reddy. New ADG of Law & Order – Banibrata Basu. New IG of Law & Order – Soumen Mitra. Ranjit Kr. Pachnanda was named Kolkata Police Commissioner in March 2011 and within two years he is replaced by Surajit Kar Purakayastha. Surajit Kar Purakayastha Kolkata Police Commissioner Profile Biodata Biography Birthday Age Address Mobile Phone Contact Number Surajit Kar Purakayastha Police Commissioner Kolkata C.P. Family Father Mother Wife Children Son Daughter Surajit Kar Purakayastha works professional life awards achievements Commissioner Police Kolkata IPS Officer Surajit Kar Purakayastha Personal Life Details. Surajit Kar Purakayastha is the new Kolkata Police Commissioner (CP) declared on 14th February 2013 replacing Ranjit Kumar Pachnanda. Let's check out few details of Kolkata Police Commissioner Surajit Kar Purakayastha. • Educational Qualification of Kolkata Police Commissioner Surajit Kar Purakayastha: - He has completed Electrical Engineering degree from Kharagpur IIT. • Background of Kolkata Police Commissioner Surajit Kar Purakayastha: - After completion of his Electrical Engineering degree from IIT Kharagpur, he joined Kolkata Electric Supply Office. Later he appeared in UPSC Exam and successfully qualifies & became IPS Officer. Surajit Kar Purakayastha completed his IPS Training at Burdwan district of West Bengal. IPS Officer Surajit Kar Purkayastha was empanelled to hold IG and equivalent level posts under the Government of India in 1985 .He was first posted at Bolpur (Birbhum district of West Bengal) as S.D.P.O. Bolpur. IPS Officer of 1985 batch; Surajit Kar Purakayastha has worked in the rank of IB later. He worked as Additional Super rank in South 24-Parganas, Asansol & Barrackpore as well. Surajit Kar Purakayastha has worked for Kolkata Police in various designations like ‘DC Security Control 2’, ‘DCDD 2’, ‘DC Traffic’ etc. After that, he became Howrah Zilla Super and then went to Iran as Research & Analysis Wing (RAW) Officer and stayed there for 5 years. Then after, Surajit Kar Purakayastha hold these ranks – DIG Vigilance, IG South Bengal, IG Law & Order. Then he became Additional DG of Law & Order. In February 2013, Surajit Kar Purakayastha named Kolkata Police Commissioner from the position of ADG (Law & Order) replacing Ranjit Kr. Pachnanda. KP Kolkata Police Constable Jobs Recruitment Vacancy 2012 Kolkata Police (KP) Online application Procedure Apply Date Schedule Interview Timings Constable 2012 Jobs Recruitment Kolkata Police (KP) Eligibility Criteria Pay Scale job location 2012 jobs recruitment Constable Kolkata Police (KP). Are you looking for jobs at Kolkata Police (KP)? Do you want to know the latest Jobs at Kolkata Police (KP)? Do you want to work in the post of Constable at Kolkata Police (KP). Then let us inform you about the recent Job Vacancy details of Kolkata Police (KP) as Constable [Man & Woman both]. Kolkata Police (KP) invites application from the eligible candidates for the 2012 Recruitment of Constable and the details as follows. • Constable Recruitment Vacancy 2012 Job Location: - Kolkata Police (KP) Constable job in Kolkata. • Name of Vacant Posts 2012 Recruitment of Kolkata Police (KP): - Kolkata Police Recruitment Board invites applications for the Recruitment of Constable & Female (Woman) Constable at Kolkata Police in 2012. • Constable 2012 Job Interview Venue Address of Kolkata Police (KP): - Kolkata Police Recruitment Board, 112 Ripon Street, Kolkata-16. • Last date for submission of application for Constable 2012 Jobs / Recruitment of Kolkata Police (KP): - 6th August 2012 till 5pm. • Where How to Apply Process of Constable 2012 Jobs Recruitment in Kolkata Police (KP): - Male & Female candidates seeking the job of Constable in Kolkata Police should submit their application at ‘Kolkata Police Recruitment Board, 112 Ripon Street, Kolkata-16’ within 5pm on 6th August 2012. Application to be written on plain paper mentioning address, contact number, email id, bio-data and after 6th August 2012 NO APPLICATION will be entertained for the Kolkata Police Constable Job 2012. Don’t forget to Apply within the scheduled date for the 2012 Constable jobs in Kolkata Police (KP) and to brighten your professional career. Kolkata Police Recruitment of Sergeant, Sub-Inspector & Lady Sub-Inspector Job Recruitment Vacancy 2012 Kolkata Police (KP) Kolkata Bengal Howrah Hooghly Online application Procedure Apply Date Schedule Interview Timings Sergeant & Lady Sub-Inspector 2012 Jobs Recruitment Kolkata Police (KP) Eligibility Criteria Pay Scale job location 2012 jobs recruitment Sergeant & Lady Sub-Inspector Kolkata Police (KP). Nearly 850 vacancies to be filled in by February-March 2012 in Kolkata Police by Kolkata Police Recruitment Board as Sergeant, Sub-Inspectors & Lady Sub-Inspector and thus Kolkata Police (KP) invites application from the eligible candidates for the 2012 Recruitment of Sergeant & Lady Sub-Inspector and the details as follows. • Sergeant & Lady Sub-Inspector Recruitment Vacancy 2012 Job Location: - Kolkata Police (K.P.) and at Kolkata of West Bengal. • Name of Vacant Posts 2012 Recruitment of Kolkata Police (KP): - Kolkata Police recruitment of Sergeant (684 vacancies), Sub-Inspector of Kolkata Police (137 vacancies) and Lady Sub-Inspector job at Kolkata Police (15 vacancies) – as per the declaration by Kolkata Police Recruitment Board in January 2012. • Sergeant & Lady Sub-Inspector 2012 Job Interview Venue Address of Kolkata Police (KP): - Kolkata Police Recruitment Board, 112 Ripon Street, New Building, 3rd Floor, Kolkata-16. • Eligibility Qualification Criteria Parameters for Sergeant & Lady Sub-Inspector 2012 Jobs Recruitment of Kolkata Police (KP): Detail information regarding eligibility criteria & Age limitations please visit www.kolkatapolice.gov.in website. • Interview Date Schedule for Sergeant & Lady Sub-Inspector 2012 Jobs Recruitment of Kolkata Police (KP): - Last date of submission of applications is 3rd February 2012 at 5pm. • Where How to Apply Process of Sergeant & Lady Sub-Inspector 2012 Jobs Recruitment in Kolkata Police (KP): - Applications in the prescribed format are invited for Direct Recruitment of Sergeant, Sub-Inspector & Lady Sub-Inspector posts in Kolkata Police. Download Application Format & check pay scale & application fee at www.kolkatapolice.gov.in website & apply by 3rd February 2012. Don’t forget to Apply within the scheduled date for the 2012 Sergeant & Lady Sub-Inspector jobs in Kolkata Police (KP) and to brighten your professional career. Ranjit Kumar Pachnanda Kolkata Police Commissioner Profile Biodata Biography Birthday Age Address Mobile Phone Contact Number R.K. Pachnanda Police Commissioner Kolkata C.P. Family Father Mother Wife Children Son Daughter Ranjit Kumar Pachananda Education Qualification Educational Life Background Police Commissioner Ranjit Kumar Pachnanda works career professional life awards achievements Commissioner Police Kolkata IPS Officer Ranjit Kumar Pachnanda Personal Life Details. Ranjit Kumar Pachananda has replaced commissioner of Kolkata Police Sri Goutam Mohan Chakraborty as per the instruction of Nirvachan Commission of India. Since, Goutam Mohan Chakraborty, ex-Commissioner of Kolkata Police, was doing the job of Commissioner for more than 3-years of Kolkata Police; it was necessary and according to the rule to change Police Commissioner before Assembly Election and for this reason only Sri Goutam Mohan Chakraborty was replaced by new Commissioner of Kolkata Police Sri Ranjit Kumar Pachnanda. • Hometown address of Kolkata Police Commissioner IPS Officer Ranjit Kumar Pachnanda: - Haryana, India. Ranjit Kumar Pachnanda, recent Commissioner of Kolkata Police, has started his professional life as policemen in 1983 when Sri R.K. Pachnanda joined Indian Police Service Training. After the successful completion of Police Training, Ranjit Kr. Pachnanda worked as a S.D.P.O. at Uluberia of Howrah in Bengal. Later moved to Karshiang as additional Police Super. In the year 1989, Ranjit Kumar Pachnanda went to Delhi as a Security Chief for VIP persons. After few years joined as a SP of CBI at Chandigarh. Ranjit Kr Pachnanda came back to Bengal as a D.C. (S.B.) of Kolkata Police in 1998. Again moved to Delhi in 2002 for taking care of Border Security Force of India. Ranjit Kumar Pachnanda came to Kolkata Police department again in 2007 and promoted as Special Police Commissioner of Kolkata Police in July 2009. Recently in March 2011, Ranjit Kumar Pachnanda became Kolkata Police Commissioner just before the General Assembly Election 2011 in West Bengal. He was given the responsibility of 'Director Security' and removed from the position of Kolkata Police Commissioner on 14th February 2013. Ranjit Kr. Pachnanda was given the responsibility of Additional Director General (ADG) of West Bengal Armed Force on & from 14th March 2013. IPS Officer Ranjit Kumar Pachnanda received many appreciations from Indian Government and State Governments. Ranjit Kumar Pachnanda was awarded for excellent Pistol shooting aim during the working life as SPG.